Areian Eghbali, a junior at the University of California San Diego, has developed an outreach program to introduce local underserved high school students to learning and career paths in STEM (science, technology, engineering and math). Called Ignite, the initiative also connects youth with UC San Diego peer mentors and an offers an opportunity to hone professional communication skills. To help fund the project, he has been named a 2017 recipient of the Donald A. Strauss Public Service Scholarship, a $10,000 award to launch his program. Each year, approximately 14 sophomores and juniors attending college in California are selected for the scholarship. The award was created as a memorial to the late Don Strauss, who demonstrated a strong, lifelong commitment to public service and education. The goal of the funding is to enable scholars to launch their project by the time they graduate. Eghbali has a deep and personal connection to the project. A year ago he began volunteering at San Diego High School. After many mutually beneficial interactions with the students, teachers and staff at the school, he decided to return a second year, this time in a more impactful way. 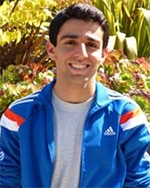 “I believe that if we bring more UC San Diego students to San Diego High School to explain the applications of what they are learning when they are in college and even later in their careers, they can see for themselves the importance of their education and its continuity,” said Eghbali. There are three facets to his student-run outreach program—exposure, immersion and presentation. First, students will be exposed to the wide range of opportunities in STEM fields. During the second phase, they will be able to apply what they have learned with the help of college students from UC San Diego, both at the university and in a career. The goal of the final phase is to enhance their presentation skills. After completing his undergraduate degree in biology, Eghbali has plans to attend medical school. In addition to his studies, he is involved in numerous service initiatives on and off-campus. He is a Triton Community Programming Leader, an instructional assistant, a medical volunteer at Palomar Medical Center, serves as an English-in-Action tutor and co-founded a start-up incubator at UC San Diego. Academic Enrichment Programs provides resources to support students interested in pursuing advanced degrees in any field. Participants also receive assistance and guidance in applying for graduate schools and scholarships. For more information about undergraduate research opportunities at UC San Diego, visit the Academic Enrichment Programs webpage.